From the dizzy heights of the 37th floor overlooking the Gherkin, London looked calm and orderly, as most things do from up above. 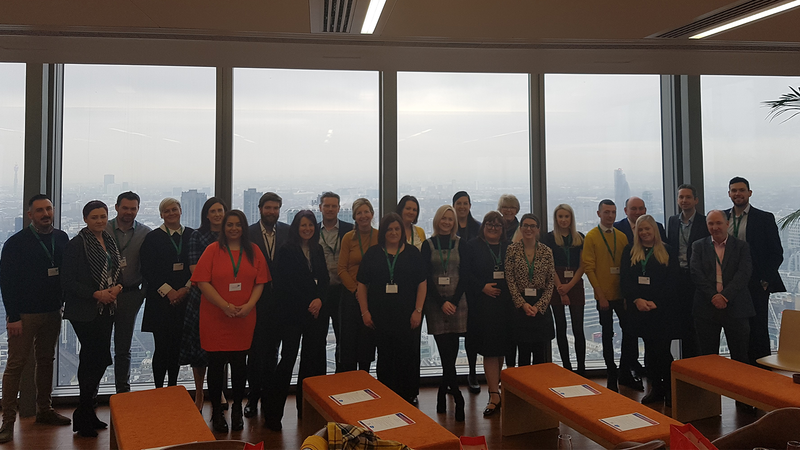 Salesforce Tower was the venue for our inaugural CCA Excellence Award winners’ lunch this week; it’s height somehow fitting a raised bar in standards achieved by those who had risen to the challenge of the most coveted awards in the sector. The attendees heard from three times award winner, Mary O’Sullivan, Programme Manager at Fexco and Stephen Clarke, Client and Customer Experience Manager at Barclays who won CX Brand of the Year and we received a very warm welcome from our hosts, CCA Platinum Partner, Salesforce. As well as winning Member of the Year, a Silver Award for achieving CCA Global Standard© accreditation for a staggering 13 years, Fexco also won Best CX Transformation Inhouse Technology. We all know too well that technology and digital transformation is not for the faint-hearted, but Mary gave some sound advice, “You have to not be afraid to fail when taking on technology projects - trust is key”. Trust in your partners, trust in your teams and ultimately trust in your knowledge and experience to know what’s right for your customers is critical for the success of any new initiative. As winners of CX Brand of the Year, Barclays have been working hard to deliver a 5-star experience to all customers by creating a mindset of cultural transformation as they move from delivering service, to delivering experiences; standards that can be applied across the business. Stephen spoke about the impact of storytelling with their submission and that all the information is at your finger-tips; it’s how you bring it to life that has the impact. Too often there’s an assumption that everyone knows more than they do - assume nothing. The point was well made through our discussion that to win an award is no mean feat. Opening up your business to experts in their field from CCA’s network, who know a thing or two about what good looks like, is a daunting prospect. It’s a bit like opening your wardrobe to industry’s fashionistas and hoping they’ll commend you on your good taste and eye for style! To hear more from Stephen, Mary and our partner Salesforce, catch up on our on-demand webinar now here. Not surprisingly our discussions brought up the ‘B’ word! Even though most of us want to avoid the topic of Brexit it’s a difficult one to ignore. Building resilience during uncertain times will be critical for businesses in the months ahead. There hasn’t really been greater uncertainty as Brexit approaches and a growing demand from customers on what it means for them and the products and services delivered by you. We joked about how we should perhaps build and navigate an IVR to answer all the questions top of mind. Indeed, it was suggested there was never a greater need for a Brexit Bot; a tongue in cheek view that a bot’s logic may be better than a human’s perspective! So, after reaching dizzying heights we are all now back down to earth and back to the hard work of talking to customers. Taking the time to showcase and recognise what is good is so important and we look forward to seeing where the awards programme takes us through 2019. Watch out for the launch date which is coming early Feb and get along to one of the preparatory workshops to give yourself the best opportunity to tell your own story and perhaps add a shiny new award to the cabinet!